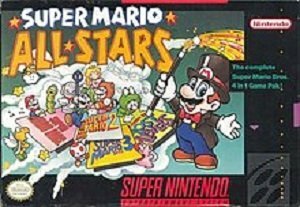 Cheats, Tips, Tricks, Walkthroughs and Secrets for Super Mario All-Stars on the Super Nintendo (SNES) We also have PRO Action replay and game genie codes. (SMB1) Fireworks – If you finish a level (touch the flagpole) when the ones digit of the time is 1, 3, or 6, there will be that many fireworks and each one is worth 500 points. (SMB1) 5000 points from Timer – Make sure you’re Fire Mario/Luigi when you reach Bowser. Blast him with fireballs, but don’t grab the axe just yet. Instead, wait the timer out, but make sure you’re next to the axe when there’s about 50 seconds left. Now get ready and time your jump on the axe so the Timer reads ‘000’. Once you reach Toad and the game adds the Timer to your score, you may notice that it changed from ‘000’ to ‘999’. Thus the game thinks you finished with ‘1000’ on the Timer and times that by 5. Note: this does not work on the Original NES version of the game. (SMB1) Extra Life at the flagpole – To get an Extra Life, make sure that when you touch the flagpole, the last digit of the timer is a multiple of the number of coins you have (Example: TIMER = 231/COINS = 11). This also works with 0. Do this correctly and instead of getting a point bonus, you will get a 1-UP. (SMB1) Restart after game over – Hold A + B on the gameover screen, then press start. (SMB2) Kill Yourself – Pause then hold L+R and press select. (SMB3) Harmless Bowser – At the end of the game, when Bowser uses his jump attack on you, duck if you are big Mario, or stay still if you are small Mario. Bowser will break the bricks, but he won’t hurt you. If you are small Mario, you can run right through Bowser and not get hurt. In other words, Bowser’s lower half is harmless, but his upper half can still hurt you. (SMB3) Hide behind scenery – To ”hide” behind scenery, simply hold down for a couple seconds while standing on a white block. Then your player can ”hide” behind scenery for about thirty seconds. then proceed all the way right on the ceiling, and press Up on the d-pad to enter the door and get the chest. Now use the first Warp Whistle on the map screen to warp to the warp zone. Then while still in the warp zone (without warping) use the 2nd whistle. It will send you to the isolated World 8 Pipe. Using a warp whistle to get to the warp zone then using another whistle in the warp zone itself takes you to level 8 no matter where you are. You can also reach World 8 by using the warp whistle in World 7 once. (SMBLL) Infinite Lives Glitch – In World 1-1, go right until you see a Red Koopa boxed in by some bricks. Hit the second brick on the bottom and obtain the Mushroom from it. Then break the third brick and either the leftmost or rightmost one, trapping the Red Koopa on a single brick. You can then stomp on it, and then on its shell like in the original Super Mario Bros.’s infinite-lives trick, infinitely bouncing it back on the wall before you can touch the ground. If you are lucky enough to own an action replay you can use the below codes in Super Mario All-Stars snes cheats on the SNES. If any of the codes do not work, or if you know of any that do work that I did not mention please post about it in a comment below. If you are lucky enough to own a Game Genie you can use the below codes in Super Mario All-Stars snes cheats on the SNES. If any of the codes do not work, or if you know of any that do work that I did not mention please post about it in a comment below. If you are playing Super Mario All-Stars on Snes9x (Or another SNES emulator which supports cheat codes) there are a ton of cheat codes you can use. You can basically use any of the codes listed under the Action replay codes + Game Genie Codes sections, you simply need to enter the required code as per below. Question : Can I use all of these Super Mario All-Stars snes cheats SNES Cheats? Answer : The cheats I have listed under “Normal Super Mario All-Stars cheats (SNES) Cheats” can be used by everyone. You will need a Action Replay or Game Genie to use the cheats listed on this page. Question : Do the Super Mario All-Stars snes cheats Cheat Codes Only Work In The Snes9x Emulator? Question : I know a good cheat for Super Mario All-Stars snes cheats that is no listed on this page, Can you add it. Question : Do you have any gameshark pro codes for Super Mario All-Stars snes cheats? I hope this article on Super Mario All-Stars Cheats + Action Replay / Game Genie Codes has helped you. If you are aware of any tips I have missed off please post about them in a comment below. Please help us out by spreading the word and sharing this article on Super Mario All-Stars snes cheats (SNES) Cheats + Action Replay below.